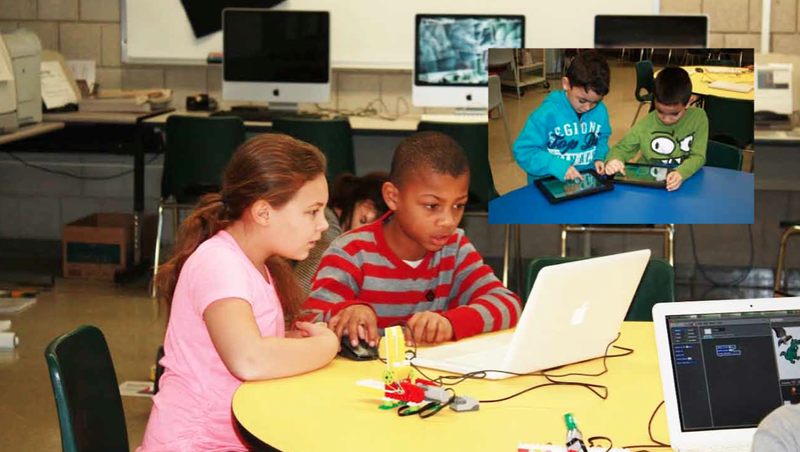 The junior kindergarten through fifth grade classes at Kennedy-Longfellow School (KLO) joined over 15 million students worldwide in participating in the Hour of Code week (December 2013). Sponsored by Computer Science Education Week, the idea behind Hour of Code is to demystify what it means to code by encouraging children and adults alike to jump in and try their hand at computer programming. Coding can take many forms. If you’re new to the concept, coding is simply teaching a computer to do something using keyboard commands. It can be as basic as writing a program that turns your computer on or off automatically and as complicated, as well, the new government health care system website! Jessica McKellar, Director for the Python Software Foundation and local entrepreneur, kicked off the day by speaking to the 5th grade students about the various career paths rooted in programming. Her speech inspired the students to continue to explore coding no matter what their career aspirations, as coding skills provide a strong foundation from the medical field to video game development. Junior kindergarten – 2nd grade students at KLO jumped into everything from moving monsters through elaborate mazes using the Kodable iPad app to programming BeeBot robots to move around a large game mat, learning math and ELA concepts along the way. Other activities included sequencing a jelly sandwich, drawing and exploring shapes with the Kinderlogo software, and programming character actions with the Daisy the Dinosaur iPad app. 3rd – 5th grade students, meanwhile, dove into Python programming through Minecraft, made Lego WeDo robots spin, rotate and talk via Scratch, and sequenced LittleBits electronic circuit components to create a “tickle machine.” Students eagerly took turns wearing a Raspberry Pi helmet-mounted webcam, beaming live streaming video of the event to all of the classrooms. Parent volunteers and the KLO math and literacy coaches were an essential part of the two days, helping to run different activities and providing guidance for students as needed. The Hour of Code event coincided with the launch of the new KLO “Makerspace” – a completely revised and revamped creative workspace that supports student-centered, collaborative engagement with Science, Technology, Engineering, Art, and Math (STEAM) projects. The open concept, flexible space is equipped with iPads, Chromebooks, a video green screen and sound booths, and allows for large and small group work. WBZ-TV (CBS) News was on hand on December 13th to capture some of the Hour of Code excitement as part of news anchor Paula Ebben’s “Eye on Education” program. You can watch the segment here: http://boston.cbslocal.com/2013/12/16/eye-on-education-ipads-being-used-in-cambridge-first-grade-class/. You can also read about it in a segment reported by Erin Balassari from the Cambridge Chronicle, “Lesley, Kennedy-Longfellow partner to reimagine S.T.E.M. learning” http://www.wickedlocal.com/cambridge/features/x1039480562/Lesley-Kennedy-Longfellow-partner-to-reimagine-S-T-E-M-learning. The event served as just the beginning of integrating a host of coding activities into the JK-5 KLO curricula. Stay tuned for future news from all of the KLO coders!